I saw this image on Facebook, after the Trayvon Martin verdict. It is a lofty sentiment, and an earnest belief. It is even true, but only if we just regard race as just a biological concept. Yes, biologically speaking, there is only one Homo sapiens. The United States Census Bureau collects data about race by asking individuals to self-identify as members of a particular race. The Census racial categories “generally reflect a social definition of race recognized in this country and not an attempt to define race biologically, anthropologically, or genetically.” According to the Census, the population of the United States can be described using five racial categories (White, Black or African American, American Indian or Alaska Native, Asian, and Native Hawaiian or Other Pacific Islander). For a definition of how these racial categories are defined, see this. The Voting Rights Act of 1965 includes provisions about race, which have an impact on redistricting. Though the Supreme Court repealed section 4 of the VRA in Shelby v Holder, Section 2 is in effect. Section 2 prohibits “voting practices or procedures that discriminate on the basis of race.” Race data from the Census is used for redistricting purposes, both to establish districts, and to evaluate whether or not new districts comply with Section 2 of the VRA. For commentary the Shelby v. Holder, check out this piece. Racial profiling is a real practice. If it were not, we would not need explicit prohibitions against it, such as this one. Seventeen States ban racial profiling outright. President Bush banned racial profiling at the federal level in 2003. At the time, Mr. Bush stated that “racial profiling is wrong and we will end it in America.” Legislation to end racial profiling at all levels has failed repeatedly in Congress. Our institutions don’t think of race as a biological construct. They articulate it as a social category. Whether we like it or not, such articulations do have consequences. They can address practices that society deems as unacceptable, but that were not considered as such under previous discoursive regimes. If you think about it, before the Voting Rights Act of 1965, literacy tests like this one were used to keep African Americans from voting. I’m not entirely sure I could pass it. I did not write this to argue whether or not the acquittal of George Zimmerman was fair. It was lawful, which speaks to the nature of the law and how it is applied (Andrew Cohen has a very nuanced treatment of the issue here). My point is that, as much as I would love to believe that we are all one big happy race, the truth supported by discourse is that we are not. #OcupaINSS vs #AmiNoMeEngañaLaDerecha: What Twitter data show (preliminary observations). On June 17, 2013, a senior citizens’ organization occupied the main office of the Instituto Nicaraguense de Seguridad Social (INSS), the Nicaraguan Social Security Institute. The group is known as UNAM, the National Senior Citizen’s Union. For at least the past five years, UNAM has been trying to get the Nicaraguan government to grant reduced pensions. By law, Nicaraguans must complete 750 weeks of contributions into the social security system to be eligible for full retirement benefits. UNAM’s membership, by and large, fell short of the goal. Unfortunately, the regulations that would have enforced UNAM’s claim were done away with in the 1990s, as neo-liberal governments were voted into office. However, the Sandinista government led by Daniel Ortega, promised to reinstate reduced pensions. They have yet to do so. Now, with Ortega is well into his second term, UNAM’s protest took off. They occupied the INSS. In total, people shared over 145 thousand tweets. #ANED generated 80,560 tweets (about 55%), and #OcupaINSS produced 66,198 tweets (approximately 45%). During the first days of the period in question, #OcupaINSS had the upper hand. On June 21, #ANED starts trending. It would overtake #OcupaINSS in a matter of hours. #ANED kept the lead for the remainder of the period.#OcupaINSS declined significantly after the government-sponsored rally that took place on June 24. #OcupaINSS peaked on June 22, as people shared the news of an attack on the protesters. #ANED, on the other hand, peaked on June 24. The most shared tweets for #OcupaINSS and #ANED on their respective peak days are pictured below. The most circulated tweet for #OcupaInss has been shared 295 times as or this writing. It is a message of support for #OcupaINSS. The top #ANED tweet has reached 70 shares. It is a photograph of a group of senior citizens waiting to receive the so-called Solidarity Bonus, temporary, at-will government aid funded with money from ALBA (Bolivarian Alliance for the Americas). The data from Topsy reflects retweets and replies for the entire sample period. Me uno a la causa #OcupaINSS #Nicaragua El futuro esta en nuestras manos. @ocupainss FUERZA y UNIDAD MI GENTE!! Topsy Pro Analytics also provides data for potential impressions. The #OcupaINSS tweet potentially garners 592 thousand impressions. The #ANED tweet reached 12 thousand potential impressions. This can be explained by the number of followers each originating account has. @LuisEnrique is a Nicaraguan musician with a well-established international career. He has almost 500 thousand followers on Twitter. @jscomunicadores, on the other hand, is the official Twitter account for the communication’s arm of the Juventud Sandinista 19 de Julio, a Nicaraguan political organization affiliated with the Sandinista party. @jscomunicadores has a little over 24 hundred followers. It is safe to assume that most of them are in Nicaragua. The decline of #OcupaINSS and the accompanying surge of #ANED might be explained by the events themselves, and by organizational factors. The decline of #OcupaINSS activity, for one, could be linked to the rally on June 24. The president of UNAM, Porfirio García, spoke at this event. He stated his organization’s willingness to come to an settlement. As of this writing, the Sandinista government has agreed to meet with UNAM regularly, to provide limited benefits, such as eye exams, to continue the Solidarity Bonus. We can assume that reduced pensions would be discussed, but there is no certainty that they will be granted. From the @OcupaINSS twitter and Facebook accounts, sympathizers greeted the agreement. They issued a statement supporting UNAM’s decision to negotiate, albeit warned that the movement would remain vigilant. In terms of organization, #OcupaINSS is not an organization in the traditional sense of the word. It is an ad hoc movement that came out in support of UNAM. #OcupaINSS did not trigger the protests in Managua, so it should not be regarded as the Nicaraguan equivalent of the so-called Arab Spring. Rather, #OcupaINSS should be considered as a short-term manifestation of public opposition to the government. The negotiation between UNAM and the government took all the impetus out of the protest. On the other hand, the Sandinista government has a well organized communication machine. This is a long-standing phenomenon. Thus, communication messages can be relayed quickly and efficiently, once a hashtag has been agreed upon. Furthermore, once the hashtag #ANED began trending, continued usage is not linked to any particular event. Even though it is a mouthful, and even though the hashtag uses up 15% of the 140 character limit, #ANED users can keep linking it to any instance where right wing media conspiracies can be implied. The data at hand is copious, so I can only offer preliminary observations as to the types of messages that each group relayed using their hash tags. I’ll use the data from June 22 as an example, as on this date #ANED’s advantage was 695 tweets over #OcupaINSS. That is as close as these two groups ever came to each other. #OcupaINSS’ top 10 tweets included statements of support by public figures, such as Luis Enrique (musician), Sergio Ramirez Mercado (novelist and former VP of Nicaragua), and Carlos Luis Mejia (musician). The hashtag also accompanied tweets by @LaPrensa, an opposition newspaper, and @Canal2Nicaragua, a television station. The rest of the tweets were issued by @OcupaINSS, a twitter account that was created ad hoc to provide information for supporters of the protest, and private individuals. On the other hand, #ANED’s top 10 tweets primarily came from the account of Adriana Blandon (@AdrianaBlandon1). This user identifies herself as a college student. She has over 8 thousand followers. There were no identifiable public figures, or news media on the list. However, one of the tweets came from @jupresidente, the Twitter account of the Juventud Sandinista 19 de Julio. Most of the messages indexed with #ANED were statements of support, including the repeated use of the hashtag itself. Since A mi no me engaña la derecha is a declarative statement on its own right, the hashtag could be appended with any further explanation. There was only one informational message, inviting people to attend the rally on June 24. As I said previously, this analysis is preliminary. I have yet to sort through the data and code it. However, I feel comfortable making some observations. First of all, it is clear that #AmiNoMeEngañaLaDerecha trended stronger than #OcupaINSS. Organizational factors should account for that, as the Ortega government’s communication strategies are not ad hoc. #OcupaINSS is ad hoc, and now that the INSS is no longer occupied, the hash tag has lost steam quickly. Secondly, #AmiNoMeEngañaLaDerecha is not merely a hash tag. It is a statement, and as such, it can be used on its own, by anyone. The hash tag is not necessarily attached to a particular event, which gives it an advantage. In this case, though, @laprensa’s use of the #OcupaINSS tag has another practical effect. It plays into the the narrative of right wing media manipulation because @laprensa is an opposition news paper. @laprensa is very open in its stance against Ortega. The paper commonly identify him as el presidente inconstitucional Daniel Ortega, unconstitutional president Daniel Ortega (see examples here, here, and here). It should be noted that those who oppose the government can also claim that #AmiNoMeEngañaLaDerecha exemplifies left wing manipulation. Without coding the data, I offer no conclusion to support either position. Finally, if you expect a Nicaraguan Spring of sorts because of social media usage, the events I reviewed here and their aftermath do not support this. Furthermore, social media is merely a tool. It is not a magic wand that creates revolutions and upheavals out of thin air. In Nicaragua, this tool also has limited potential. Only about 11% of the Nicaraguan population has internet access, and those who do have internet usually reside in urban centers. This means that movements that rely primarily on social media exclude more people than they include. However, the most important factor that hinders the opposition’s social media strategies is that they’re usually ad hoc and short lived. They are subject to changes in the political landscape, as everything else is. That is exactly what happened with #OcupaINSS, though some might argue that the movement isn’t dead. I would suggest that movements can only survive if it has long term goals. #OcupaINSS did not. It’s rival hashtag does. Nicaragua’s Senior Citizens Fight for Pensions. Sandinista Thugs Attack Elderly in Nicaragua. Catholic Church Denounces Mob Violence. Embassy Warns about Pro-Government Protest. Pension Protest Leader Appears at Sandinista Rally. Por esa razón, la JS creó la etiqueta #AmiNoMeEngañaLaDerecha. Veintiún caracteres que se utilizaron para aglutinar mensajes en contra de #OcupaINSS (nueve caracteres). Twitter tiene un límite de 140 caracteres cuando no se incluyen links a otras páginas o archivos (en ese caso, el límite es de 117 caracteres). La etiqueta de la JS equivale al 15% de los caracteres disponibles para el mensaje. Me pregunto si eso también fue analizado en el taller. Una etiqueta más corta permite compartir más contenido. Me imagino que la idea de manipular la foto original trató de explotar el hecho de que el periódico Hoy publicó una foto de una protesta colombiana en su página de Facebook. Ese hecho se convirtió en la evidencia más citada de manipulación mediática. Hoy se disculpó por la fotografía. Lo mismo hizo el periodista de La Prensa, Fabián Medina, quien también circuló la foto creyendo que era de Nicaragua. El uso de los medios y tecnologías para persuadir es parte de cualquier campaña que busca influenciar el debate público. Eso es un hecho. Sin embargo, cuando se acusa al contrario de manipular la información, también debería de crearse un espacio para la autocrítica. Si se divulgan imágenes descontextualizadas y obviamente manipuladas, ¿con que derecho se reclama que el contrario hace lo mismo? La Juventud Sandinista tiene a su disposición imágenes impresionantes de la marcha financiada por el gobierno. El contexto lo pone quien escribe la historia. El lector interpretará lo que quiera. Entre menos sepa acerca de como se organizan las marchas patrocinadas por el gobierno de Ortega, mejor. En una sociedad que enfatiza lo visual, el poder de las imágenes es casi incuestionable. ¿Para qué, entonces, se pierde el tiempo divulgando fotos alteradas? Parody: (1) a literary or musical work in which the style of an author or work is closely imitated for comic effect or in ridicule. (2): a feeble or ridiculous imitation. (Merriam Webster). On the internet, many believe themselves parodists. However, if you take Merriam Webster’s definition as a standard, many among those many are just plain wrong. Posting fake news is not a parody. It is a lie. This is a fake account. They declare it clearly on their profile. They are also in breach of Twitter’s impersonation policy. First rule of thumb: check the profile of your Twitter source before you re-tweet. It only takes a click. If Twitter has verified the profile, it will display a check mark next to the name (they really should add that to every tweet, but they haven’t). 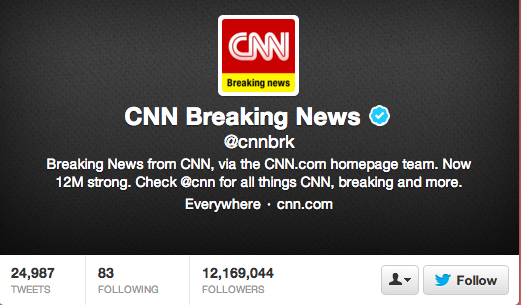 If the check mark isn’t there, the account is a fake, and might be in violation of the terms of service. 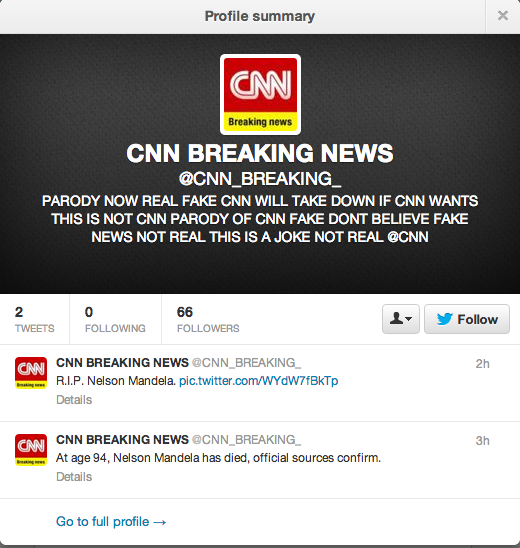 If you check so, you won’t be causing unnecessary grief to your friends by re-posting items like @CNN_BREAKING_’s hoax message about Nelson Mandela’s death. The account has since been suspended, but not before circulating “R.I.P Nelson Mandela” accompanied by a picture of Morgan Freeman (gasp!). Mr. Mandela is in his death bed as of this writing. No one credible has reported otherwise. I won’t even comment on the accompanying picture of Morgan Freeman. SMH. Gabby Giffords is NOT DEAD. 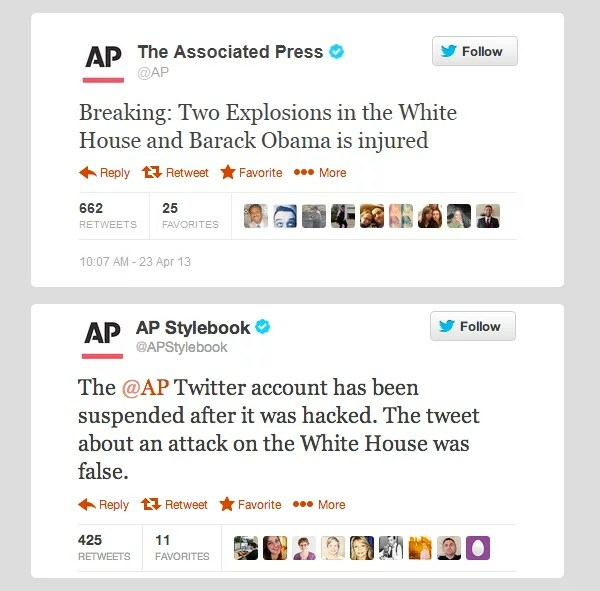 The AP account was hacked. You are not defenseless in those situations either. You just should to wait before you tweet. While you wait, you can try to independently verify the information by triangulating. However, even then, waiting might be the best strategy. If reputable news organizations fall for the information, as they did in the NPR case, triangulation is pointless. However, false reports are usually debunked fairly quickly. The Joe Paterno death report is an example. That was debunked within 45 minutes. Verifying information won’t kill you, and waiting won’t kill you. Please do it before you tweet. Have you ever heard of Mediamass? They describe themselves as a satirical website. Their goal is to skewer contemporary media by pointing out the flaws of mass production. I have no problem with satires that target the mass media, if they are done in a way that most people would identify the content as satire without further explanation. That’s behind the success of The Onion, The Daily Show, and The Colbert Report. They’re court jesters, reminding society of its flaws, one exaggeration at the time. Unfortunately, that is not Mediamass. The problem is execution. You can’t tell it’s satire just by looking at their content because their concept is “to select the most typical, representative and recurrent articles across Gossip magazines and to make them available for all the celebrities in our database.” In praxis, that translates into a stockpile of articles that Mediamass uses for everyone. Nelson Mandela, Henry Cavill, and Brian Wilson are just a few examples. I did not post screen captions of any of these pieces, though I have them available. The reason? Mediamass doesn’t want you to “reproduce” any of their stuff, “even with permission.” Protective much? There is a clue that these news are fake. The update link takes you back Mediamass’ “About us” page, which explains their project. I have mixed feelings about this strategy. On the one hand, once your read the description of what Mediamass is/does, then it is clearly a satire. On the other hand, satire doesn’t need to add a disclaimer. You can recognize the satire in Jonathan Swift’s A Modest Proposal because no sane person would propose cannibalism as a remedy for poverty. The exaggeration is evident, as is the object of the satire. When taken as a whole, the exaggeration and its object are also evident in Mediamass, once you read the “about us” section of their website and other disclaimers they have posted. In their words, “Mediamass articles in the People section are inherently fictitious – but based on real news. Thus, the theoretical possibility of each story, multiplied by thousands of celebrities in our database, makes it statistically inevitable that once in a while one of our fictionnal [sic] story fits the reality.” This is what happened when actor James Gandolfini died. On that day, Mr. Gandolfini received the Mediamass treatment, joining Mandela, Cavill, Wilson, and everyone else. The story has since been taken down, probably due to the backlash that ensued. I highly doubt that, though. Mediamass replaced the Gandolfini piece with this article, but they also published a second piece, claiming Gandolfini is still alive. That is standard operating procedure at Mediamass when it comes to confirmed celebrity deaths. They shift gears, and they can do so easily. After all, that’s the beauty of their collection of stock articles. They can just switch out the story. That is how Gandolfini received the same treatment as Pierre Mauroy, former French Prime Minister, and Jean Stapleton. I think the best way to describe Mediamass is not satire. The site is a great example of Simulacra. Mediamass sticks very close to being plausible by design, because their brand of satire relies on the aggregation of content. They are skewering mass production, and what better way is there to mock mass production than to mass produce? However, their “network of artificial signs [is] inextricably mixed up with real elements” (Baudrillard,, 1994, p. 20), which winds up leading the reader back to “the real.” The sad part, though, is not what happens when someone seeking information stumbles upon one of Mediamass’ articles and believes it. The real problem is when media organizations do it. It’s even worse when they copy and paste material from Mediamass to debunk a hoax without acknowledging that they got it from Mediamass. Hoax debunking site Wafflesatnoon bemoaned this practice in their entry about Mediamass. Perhaps the best lesson to take away from Mediamass is that we need to hone media literacy skills. Even then, we might fall for a hoax, or a hoax about a hoax. As for it’s ability to make society reflect upon the ills of mass produced media, that’s plausible, but only if you read the disclaimer. Otherwise, you would have a hard time figuring out what they’re trying to do. Does that defy the purpose of the project? You tell me. Revising and diagraming the melting pot myth. This project started back in 2006, when I first became interested in Ugly Betty. I am currently re-writing an essay that looks at Ugly Betty as a story of undocumented immigration. My main contention is that the stories about immigrants to the United States are usually shaped by the myth of the melting pot. Namely, immigrants are the huddled masses, who come to the U.S.A. in search of opportunity. However, before they can reap the full benefits that the U.S.A. has to offer, they must undergo a rite of passage (see Van Gennep and/or Turner). Ideally, the passage leads to gradual assimilation, as immigrants adopt American ways and shed their own customs. If they assimilate fully, immigrants incorporated into the receiving community and granted rights. If they fail, they are doomed to an eternity in liminality. 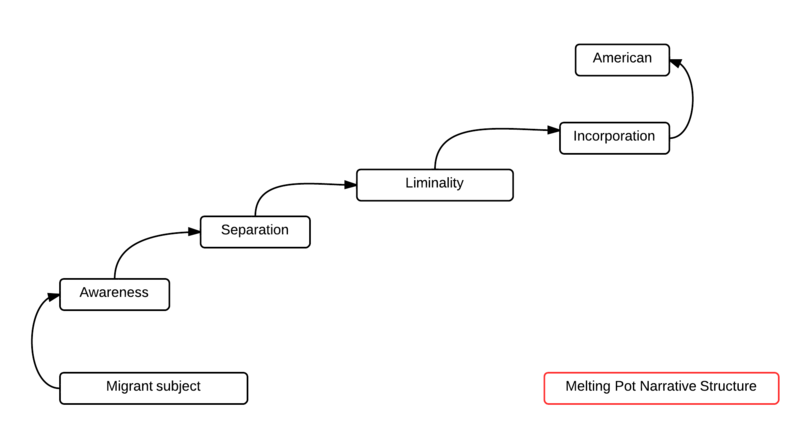 I came up with this diagram to explain the narrative structure of the melting pot myth. Since I’m dealing with undocumented immigration, though, this structure doesn’t fit. Undocumented immigrants cannot be fully incorporated into the receiving community because they have committed a transgression against the receiving community. Territory, once settled and demarcated, is considered sacred (see Van Gennep). Therefore, I came up with a different diagram that offers two alternatives, one leading to incorporation, and the other one leading back to a status that I am calling liminal residence (you reside in the receiving country, but lack the rights of the native born or naturalized).